'Tis the Season, that special time to preserve our garden’s bounty for enjoyment long after summer is gone. Preserving is about enhancing your garden’s bounty; bringing together more than one ingredient from your garden; using the peppers and onions and garlic and apples to make spiced apple chutney. This is taking apples to a whole new level, beyond just eating an apple out of your hand. In a way, preserving our garden’s produce is not just providing for your future self, but also respecting your whole self. The self that tended the garden and is now bringing that produce beyond just today. I feel so alive after finishing a batch of pickles, or plum butter; I just can’t explain the thrill of filling up a larder for winter consumption. 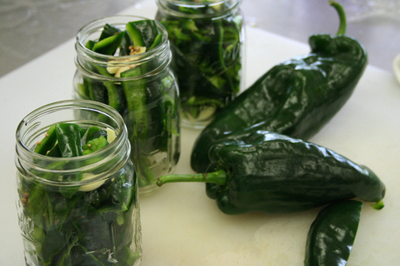 We have already been sharing our preserved bounty with neighbors and friends, and so far, we have gotten rave reviews! There are so many ways to preserve our garden’s produce. Let me count the ways. The simplest is Cold Storage. Examples would be hanging your onions and garlic, or storing carrots in a bucket of dry sand. Cold storage means a cold (not freezing) and dry space. My childhood home had a ‘root cellar’, a room off the rest of the basement that was certainly not heated, but used to store mostly root vegetables: carrots, potatoes, beets. Drying. The simplest example would be of herbs; oregano, thyme, and winter savory can all be dried then the leaves can go into small jars or little bags. Don’t forget the lavender; I hope you have been harvesting it and making sachets for your closets and drawers. Here’s a great little DIY! Freezing. Simple, easy, and great to enjoy in the dead of winter. Some vegetables need to be blanched before freezing (place in boiling water for 2 to 5 minutes, drain and plunge into ice water, drain again, pat dry, and place in freezer bags); fruits (berries) do not need to be blanched. Water Bath. This is true canning. The vegetable or fruit is cooked. The jars and lids are sterilized. You can do the vegetables plain or create something fantastic. 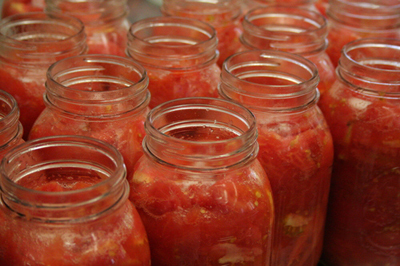 There is nothing like opening a jar of tomatoes in January and the aroma is pure summer! Personally, pickles (especially from zucchini) and relishes are a favorite of mine. Pickling in a salt brine, or vinegar brings a new dimension to the cucumber, zucchini, beet, and turnip. Let me also mention Quick Pickles. You still need to use the sterilized jars, but not the water bath. 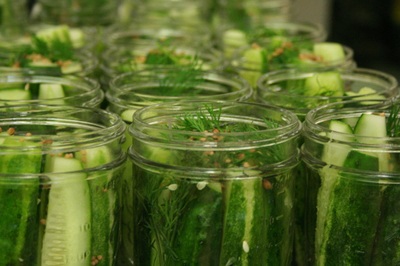 Keep all quick pickles in the refrigerator and eat within a few weeks of pickling. We have pickled turnip and beets with one fresh red chili pepper in each jar; this will bring on the heat in the middle of winter! Preserving with Sugar. Ah yes, jellies and jams. Fruit is heated with sugar (lots) and lemon juice. Additional pectin is not always necessary. Jars and lids should be sterilized. Plums, peaches and apricots, raspberries, and blueberries will all make excellent jams and jellies. You can also preserve food in Alcohol. Because the alcohol is already fermented, it preserves your food the longest. The longer the maceration in alcohol, the more tender the fruit. Preserving in Oil. This is an ancient method used in India and Pakistan. This year my daughter is preserving fresh peppers, hot and sweet, in oil. So far, really delicious. These can be used quickly or can last for a few months. Sterilize the jars and lids. Besides some old family recipes, I would recommend these books for use when preserving your garden’s bounty: The Joy of Cooking for the basics of canning and jamming; Jams, Conserves & Preserving for some new and different choices; Quick Pickles for everything you need to know about pickling without the water bath. Hoping you enjoy your garden’s bounty as it comes out of the garden (or your favorite farm stand), and as you prepare it for later consumption, you can look forward to serving it to family and friends this winter.